Mendeley and Elsevier - what does the future hold? When the acquisition was announced back on April 9th, we confirmed that Mendeley's senior management team would remain in place. In the days that followed, Mendeley co-founder, Victor Henning, spoke publicly about the rationale behind the deal. In an article on Elsevier Connect, he explained that it just made "intuitive sense" to him. He said: "We started Mendeley to help researchers, and Elsevier lets us do that for a much larger community." He also highlighted some of the advantages for users - for example, thanks to the acquisition, Mendeley could immediately double user storage space free of charge. Since then, Henning has joined the Elsevier strategy team as a Vice President of Strategy, and is a regular visitor at the Elsevier Amsterdam office. In fact, he is planning to relocate there. 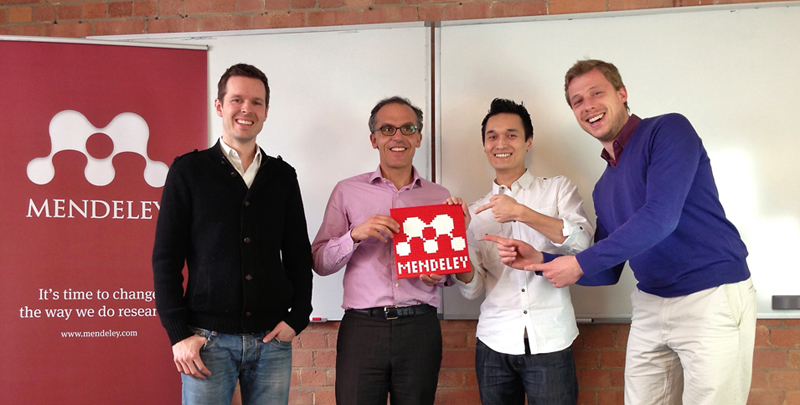 He explained: "As the weeks have passed, I've become even more excited about the Mendeley-Elsevier partnership. While meeting many of my new colleagues, I have been offered a sneak peek at the initiatives underway at Elsevier designed to serve authors and researchers better. Many of these initiatives mirror ideas which we at Mendeley would have liked to pursue as well, but had to put off because we didn't have the resources - ideas around recommendation engines, text mining, interactive content, raw data, and open access. "Mendeley and Elsevier are serving the same audience - researchers around the globe - and are covering different parts of the scholarly workflow. Now that we are part of the Elsevier family, we have started to close the gaps in this workflow and make it more seamless. For example, as one of our first steps, we have already added support for all Elsevier journal citation styles, making it easier for authors to properly format their articles when submitting their work to Elsevier journals. And because we have shared these newly-generated citation styles with the open CSL (Citation Style Language) repository, the styles are not just available to Mendeley users, but to users of other tools like Zotero, Papers, BibSonomy, Docear, Qiqqa, and others." He added: "We are also examining how we can use Mendeley's recommendation technology to direct authors to the right journal, enable article submissions straight from Mendeley to the Elsevier Editorial System (EES), and integrate Mendeley's reading and annotation tools into the peer-review process. There are more ideas which I can't yet share, and it will take time to implement them - but they all have the potential to radically improve the author experience and make researchers' lives easier." Olivier Dumon, Managing Director of Academic and Government Markets for Elsevier, is equally excited about the opportunities offered by the new partnership. Dumon led the team that worked on the Mendeley acquisition, and speaking after the deal was announced, he commented: "Sometimes business collaborations show so much potential they should just go all-in, and that was true in this case." He explained: "We have long known that researchers encounter a lot of pain points across their workflow – whether that's keeping up to date with other research or submitting research papers of their own. "While we can already help them with a number of these steps, we realized we wanted to improve our support for two of the most important ones – the sharing, collection and storage of data and the writing of papers. "Researchers use Mendeley for its document and reference management, collaboration, analytics and networking tools, and the Microsoft Word plug-in is a fantastic aid when it comes to writing." "By offering integration between Mendeley, Scopus and ScienceDirect, we can make this combined platform the central workflow and collaboration site for authors. In addition, we will be able to provide greater access to a growing repository of user-generated content while building tools that will enable researchers to search it more precisely." Dumon also believes the partnership will have a positive impact on areas such as altmetrics, getting real-time information on hot articles across publishers based on Mendeley readership metrics. He said: "That will help librarians assess their collections and render all publishers' content more discoverable." Co-founders Jan Reichelt, Paul Föckler and I started Mendeley to solve our own problems. Back in 2007, we were PhD students with hundreds of academic papers stored on our computers and no good way to make sense of them. Existing reference management tools seemed too cumbersome, clunky, and expensive - they cost hundreds of Euros, required a lot of manual data entry, and wouldn't even store the metadata and the PDFs together! So we wondered: Why wasn't there a tool that could extract the relevant metadata - authors, title, year, journal, volume, issue etc. - automatically from PDFs, and help us manage the files? A tool that would also let us read and annotate PDFs, cite papers in Word, OpenOffice, or LaTeX, and allow us to set up collaborative groups for sharing and discussing research? In short, a tool for helping us with our entire workflow from content discovery, to document management, to authoring and collaboration? After realizing that such a tool did indeed not exist, we began to create it ourselves. Fast forward to 2013: Mendeley is now a global academic community. Collectively, our users have uploaded more than 400 million citations and documents into their Mendeley accounts. Our users' aggregated, anonymized metadata - available via the Mendeley API (application programming interface) - powers more than 300 new third-party research apps, e.g. document management on Android and Kindle, altmetrics apps like ImpactStory.org and Altmetric.com, and citation plugins for web and learning platforms like WordPress, Drupal, and Moodle. A. No, it isn't. Mendeley keeps each user's library private and accessible only by them. It is not possible to search for an article on Mendeley, see if another user has it in their document library, and download it from there. Instead, when Mendeley users search for or discover an article on Mendeley, we only show them the metadata - then link to the original publisher via DOI, or to the user's institutional library via OpenURL. As such, Mendeley is a major driver of traffic and article usage to publishers. Over the past few years, Mendeley had struck agreements with several major publishers and societies, e.g. Springer, IEEE, De Gruyter, and others, about providing us with metadata and document feeds to augment, clean, and complete our database, as cleaner and more complete data meant more traffic, usage, and altmetrics impact for publishers. Now, with Elsevier's support, we hope to grow our collaboration with other publishers to a much larger scale. 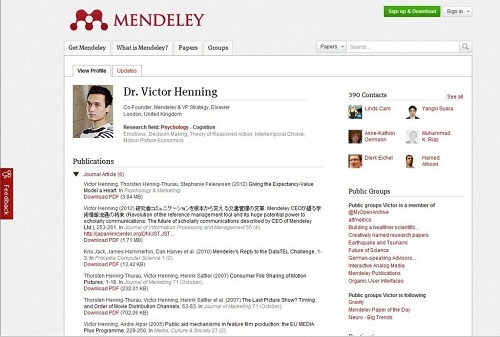 Each Mendeley user has their own profile page - mine is here: www.mendeley.com/profiles/victor-henning/. Users can upload their own papers to their profile to 'self-archive' them and make them available for download on the web. It is entirely up to the user whether to opt into this functionality, and whether to upload only a metadata reference, a pre-print or post-print PDF, or a PDF of the final published version. We require our users to adhere to the copyright of their publisher when doing so, and the Mendeley user interface will incorporate explicit referrals to the SHERPA-RoMEO policies of the publisher in the near future. The other way of sharing articles on Mendeley is via 'Private Groups'. These are a collaboration space - much like Basecamp, SharePoint, or Google Docs - in which members of a team can keep track of references for a research project, collaboratively annotate documents, and discuss open questions. Private Groups are invisible from the outside, and are accessible by invitation-only. Free users of Mendeley are restricted to one Private Group, with a limit of three members including themselves; paid users of Mendeley can create groups of five up to 50 people, which are popular in labs and departments. A. First and foremost, Mendeley is a workflow tool that wants to make researchers' lives easier, no matter whether they are working with OA or non-OA content. When a researcher discovers OA content on Mendeley, we are able to offer them a direct download into their Mendeley library, whereas we have to send them to other publishers' or library websites if they want to access non-OA content and we don't yet have an agreement with the publisher. Reaching such agreements is one potential benefit of working more closely with the rest of Elsevier. Many members of the Mendeley staff and community team are personal believers in the OA movement and see it as the way forward for publishing because if all content were OA, then all content would flow without friction around the web and into/through researcher workflows. Victor Henning is co-founder of Mendeley and Vice President of Strategy, Elsevier. He holds a PhD from the Bauhaus-University of Weimar, where he researched the role of emotion in consumer decision making. The Foundation of the German Economy granted him a doctoral dissertation scholarship in 2006, and the Royal Society of Arts elected him a Fellow in 2011. He completed an MBA at the WHU Koblenz, the Université Libre de Bruxelles, and the Handelshøyskolen BI Oslo. Victor has also worked as a Talent Scout A&R for Sony Music/Columbia Records in Berlin, Germany, and in various roles at punk/garage label Revelation Records in California, USA. In parallel to writing his MBA thesis, he also co-founded the Korova Bar in Vallendar, Germany. Before joining Elsevier in February 2012 as Managing Director of Academic & Government Markets, Olivier Dumon served as Vice President of Product Management for AT&T Interactive and Senior Director of Search for eBay. Previously, he worked for eBay in France and co-founded an online collaboration start-up that he sold to a B2B publisher. He was born in Paris and moved to the United States to attend Harvard Business School, where he completed an MBA in 1998.